Iranian Parliament Speaker says Tehran welcomes Riyadh’s positive role in establishing security in the Middle East, but is opposed to its warmongering policies in Yemen and Syria. “As the problem was resolved in the case of Lebanon, all countries, particularly Saudi Arabia, should know that Iran is not their enemy and is not opposed to their positive role in the Middle East. 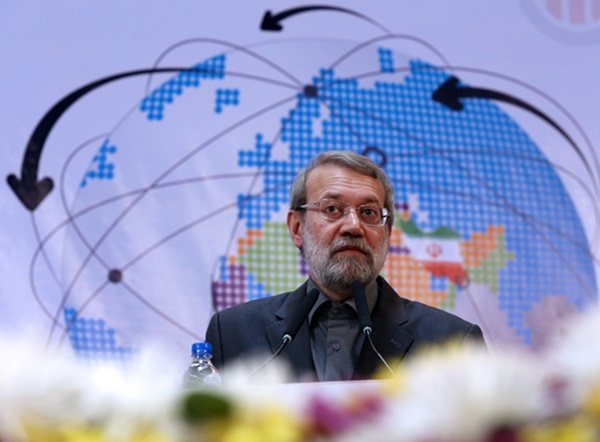 It rather welcomes such a role,” Ali Larijani said in Tehran on Sunday, addressing the International Conference on Regional Security Order in West Asia. “We are actually opposed to warmongering in Yemen and Syria and believe it to be wrong; therefore, we explicitly declare that we respect the role played by all Muslim countries in the Middle East in establishing peace in the region, and consider it as beneficial,” he added. According a report by IFP, Larijani stressed that the current security chaos in the Middle East cannot be resolved in the short-term, but Iran is ready to join hands with all Muslim countries to end this crisis. As regards the root causes of ongoing insecurity in the Middle East, Larijani pinned the blame on major world powers and certain regional states. “Using terrorism for tactical objectives is the strategic mistake made by world powers and regional states and is the root cause of insecurity in the region,” he added. Noting that this strategy has been pursued by world powers and regional countries since the occupation of Afghanistan by the former Soviet Union, he said that they continued this policy until today in Iraq, Libya, Syria and Yemen and “practically, this strategy has led to the spread of terrorism”, Fars reported. “These acts of interference have been a main factor in the spread of terrorism in the region; NATO’s presence in Afghanistan for countering terrorism has been ineffective, and the war on Iraq also created terrorism in the region,” he explained. Larijani went on to say that trans-regional powers are incapable of providing security in West Asia, describing their apparent counter-terrorism efforts as mere propaganda that plays “an influential role in creating crisis” in the region. The social and political situation of the regional nations preclude any chance of success for foreign powers, he added, saying outsiders lack competence to ensure regional security because their interference in the region has been aimed at backing the Israeli regime, Tasnim reported.